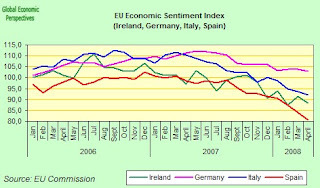 The European Commission’s eurozone “economic sentiment” index which fell sharply from 99.6 in March to 97.1 in April – the lowest level since August 2005. With the indicator regarded as good guide to growth trends, the unexpectedly steep decline pointed to a marked deceleration in economic activity. Still, eurozone countries show varying performances. Economic sentiment in Spain, which is at risk of a serious house price correction, has fallen to the lowest level since late 1993. But sentiment in Germany and France remains relatively robust – falling to the lowest levels since February 2006 and December 2005 respectively.